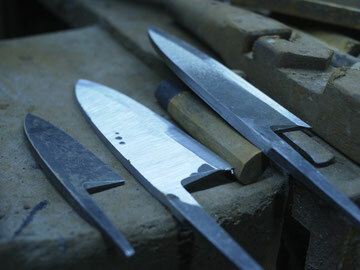 The root of knives is piece of obsidian and quartz which are known as chipped stone tool or polished stone tool. Sakai is known as one of the oldest city in Japan because in fact many ancient burial mounds are found in Sakai so that technology is developed in Sakai and many metallic tools are invented and manufactured about 1,500 years ago. And Sakai developed as the biggest industrial area. In 15th century, a lot of SAMURAI SWORD is made in Sakai. People in Sakai had advanced techniques for metallic tools so the made not only the swords but also firearms which is introduced by Portuguese visitors. In 1573, Shogun Tokugawa authorized to produce knives with the SAKAI on its knives, and since then Sakai Knives has been known as the best quality knives in Japan. "英/HIDE", one of the best Japanese Traditional Handcraft Brand, was authorized as the important cultural product in 1982 by Japanese Government. Now we would like to provide this high quality and soulful hand made knife to chefs all over the world.